Welcome to Camorr, a Venice-like city with sharks... home of the Gentleman Bastards, a gang of thieves and conmen who use elaborate plots to rob the elite of Camorr, more for the challenge than the money they take. 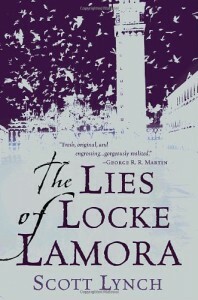 The unfolding plot is interwoven with interludes to Locke's formative years, deftly illustrating his rise from cocky street urchin under the thumb of the thieftaker to being taught by Father Chains to become the leader of the Gentleman Bastards. The interludes really help flesh out the other members of the Gentleman Bastards and how they became a tight group. Yes there is lots of swearing and violence but hey it's not a children's book, more Renaissance Tarantino and i loved it.